Some of my favorite skincare is based on the idea that less is more. It can be hard to find brands with this same ideology which is why I was really excited when I found out about Dr. Roebuck's skincare. This line is inspired by all things natural and contains no fillers, parabens, sulfates or phthalates. The products are natural, organic and packed with active ingredients to provide maximum effectiveness. Cleanse | This cream cleanser features six antioxidants which are ideal for hydrating and calming even sensitive skin. I've used this on a daily basis and have really enjoyed how soothing it feels. I do not use this as a makeup remover but I typically use it in the morning and at night for an extra boost of hydration before my moisturizer. Key ingredients include jojoba seed oil and shea butter which nourish and leave skin feeling silky smooth. 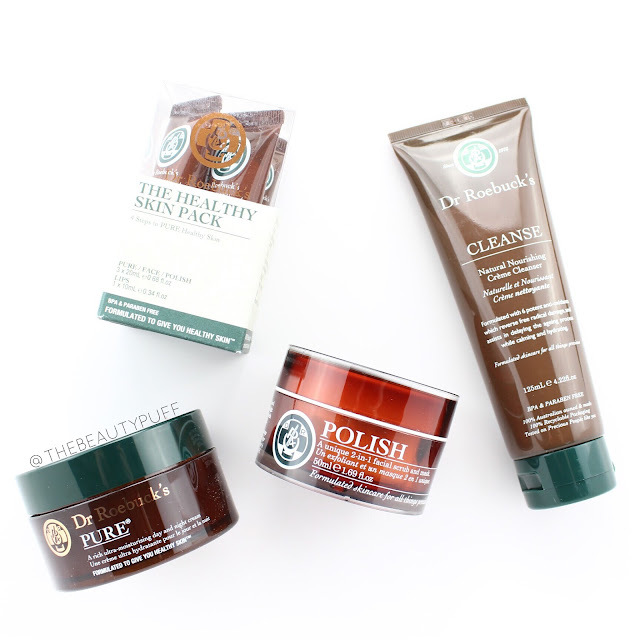 Polish | A mask and exfoliator in one? Yes please. Polish combines the exfoliation of a scrub and the nourishment of a mask all in one comfortable formula. The exfoliants are 100% biodegradable ecobeads which work to unclog pores and rid the skin of dead skin cells and toxins. Kaolin helps for a deeper clean while jojoba beads calm the skin. My skin is left smoother and more refined after each use. I love the gentle, yet effective formula of this product. Definitely one of my favorite discoveries. Pure | This moisturizer is a very rich formula which I love to use as a night cream. It features glycerin which keeps skin soft and helps it retain moisture. If you have normal or dry skin, you'll love this any time of day! While I wouldn't necessarily use this under my makeup because my skin is combination this time of year, I have enjoyed it on my "no makeup days." With our recent burst of winter weather, this moisturizer really saved my skin and kept it hydrated and comfortable. (Even while clearing snow in the blizzard!) A must for the winter. The Healthy Skin Pack | As with any skincare, it's always nice to try multiple products to find favorites and see what works best for your skin. The Dr. Roebuck's Healthy Skin Pack includes .66 oz samples of Polish + Pure, as well as a .66 sample of Face (a fantastic everyday moisturizer) and a .33 oz tube of Lips (a natural lip balm). Face is an anti-aging moisturizer that is suitable for all skin types and I've loved this one during the day! It leaves the skin feeling smooth with no residue but still thoroughly quenched before makeup application. Lips features grapefruit oil to nourish, macadamia oil to smooth, peppermint oil to hydrate, and vitamin E to keep lips supple. This was another must for me while outside in the snow. It kept my lips comfortable and moisturized out in the wind. Plus it smells like peppermint, yum. You can find Dr. Roebuck's skincare line on their website as well as Sephora's website below.